Hi Everyone Happy Father’s Day! Today for #SundaySupper we had to make a man recipe. Well when I think of a man recipe two things come to mind, bacon and beef. So I thought, hmmmm, add a little chipotle pepper to it and you will have the perfect manly meal, and oh a perfect meal for me too! he he So for today’s recipe I made Stuffed Chipotle Bacon Cheeseburgers! Oh my gosh, amazing!! This is one out of the world burger. 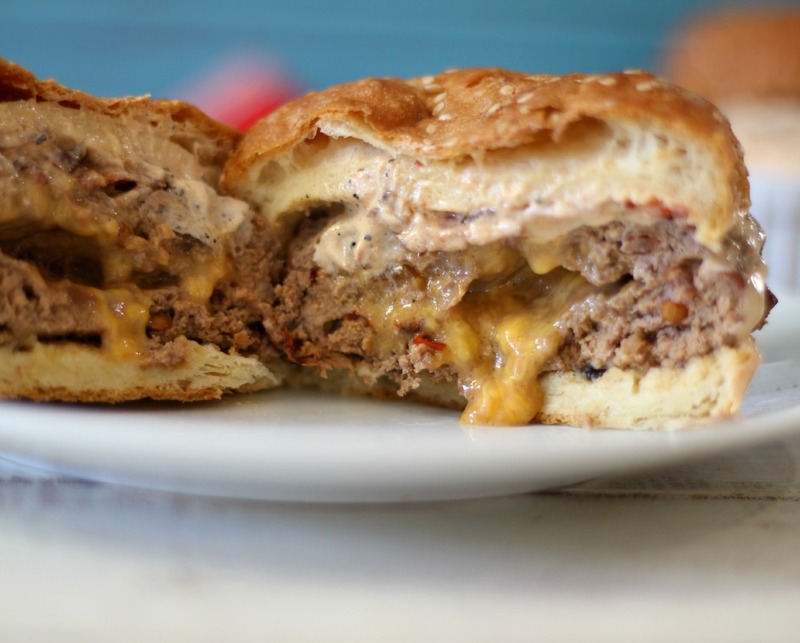 It is made with chipotle peppers, bacon and stuffed with cheddar cheese. My gosh a burger couldn’t get any better in my mind. After all we all know nothing is better than bacon! What’s to boot you have just enough bacon in the recipe to give it the perfect flavor, so it is not a lot of calories, plus if your like me top it with a little bacon too, why not? It’s Father’s Day, time to splurge! Oh and one of the best parts is my Chipotle Aioli Sauce. Its spicy, creamy, low-calorie and darn good! I use it all of the time! Since I am talking about the Chipotle Aioli Sauce I should tell you it’s not just for burgers, but is great for dipping sweet potato fries, baked veggies, chips and even grilled chicken. It’s made with greek yogurt, lime juice, mayonnaise, cumin and of course finely chopped chipotle peppers. I LOVE this sauce! It has made an appearance on my blog several times over the past few years and I can guarantee you will see it again soon! For the burgers, I used lean ground beef and mixed it with cooked bacon, ground pepper and chipotle peppers. Yes, this is kind of spicy burger. Hey, I like the heat. But you can tone it down with the peppers. Just use your best judgement. For an added boost of flavor and fun, I also stuffed the burgers with cheddar cheese. Cheese is wonderful and a little bit goes a long way in the recipe. Making the burger is pretty easy too. Once I mixed everything together, I weighed my meat into 2oz size patties. I added a little bit of cheese to one patty and topped it with the other 2oz, to make a 1/4 pounder burger. I let it sit in the fridge for a few minutes and off to the grill it went. 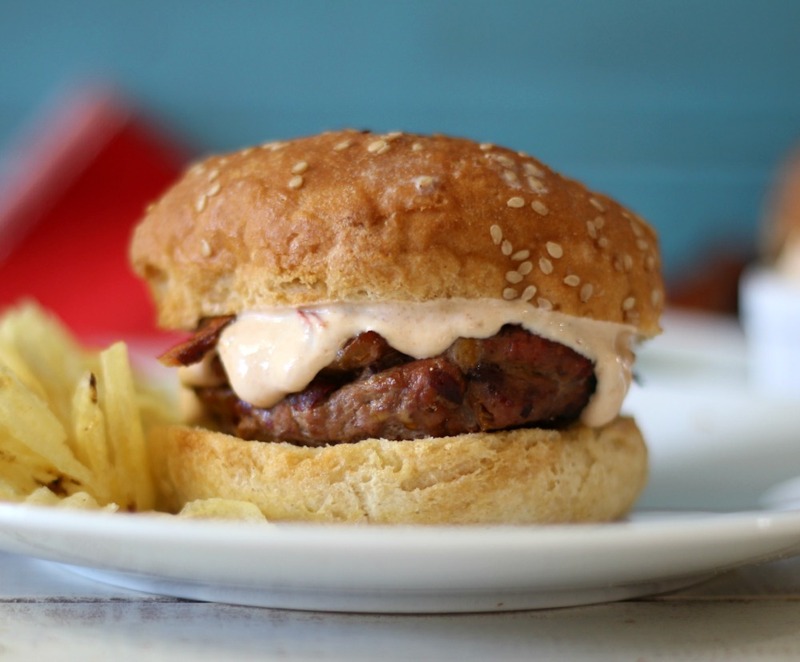 Cook each side for about 5 minutes and you have the ultimate Father’s Day burger! A juicy, spicy burger made with chipotle peppers, bacon and stuffed with cheddar cheese and topped with a spicy, healthy creamy sauce. In a bowl, add ground beef, pepper, chipotle peppers, chipotle sauce and bacon. Mix with your hands until combined. Divide into 8 2oz size patties. Place about tablespoon of shredded cheese into the center of four patties. Place the remaining 4 patties over the of each patty and shape into a hamburger. Place onto a plate and press a thumb print into the patty. Place in the refrigerator. Meanwhile, heat the grill over medium heat. 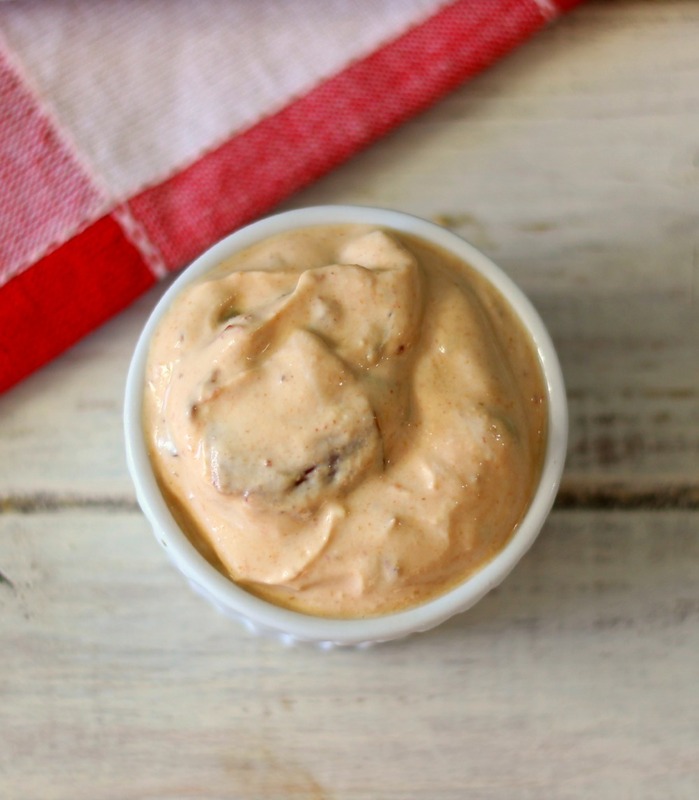 While grill is heating up, make your chipolte Aioli Sauce. In a bowl, add greek yogurt, mayonnaise, lime juice, cumin, chipotle peppers and chipotle in adobo sauce. Mix until well combined. Taste it, if it's to hot, add more greek yogurt, if it's not hot enough add more chipotle pepper. The heat depends on your liking. Place in the refrigerator until ready to serve. Cook the burgers. Place burgers on the grill and cook each side for about 5 minutes for a medium cooked burger. 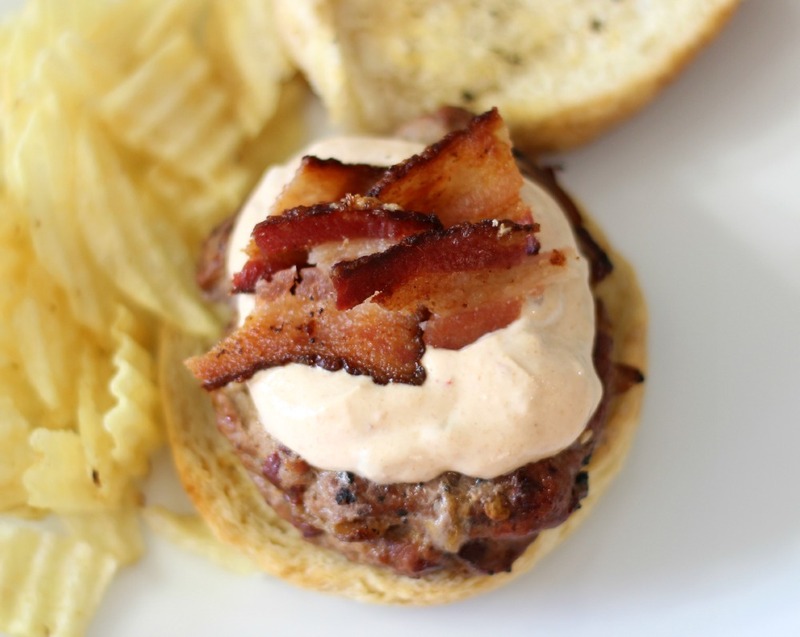 Place the burger onto a hamburger bun and top with chipotle aioli sauce and add additional bacon if desired. Calories do not include the roll. Most rolls are about 200 calories. I know I am a woman after all, but to be honest these are my kind of meals! I love peppers and beef and well I have to say a hamburger is probably one of my favorite indulgences. I could probably live on burgers. Nothing like somethign stuffed between two pieces of bread! I wanted to let you know for the bun I used a gluten-free roll and oddly enough my family liked it! Score! I want to wish all of you Dad’s out there Happy Father’s Day! I hope you have a relaxing day!! Now be sure to check out the recipes from the #SundaySupper crew. I can’t wait! The recipes all sound so delicious! Love this Burger! 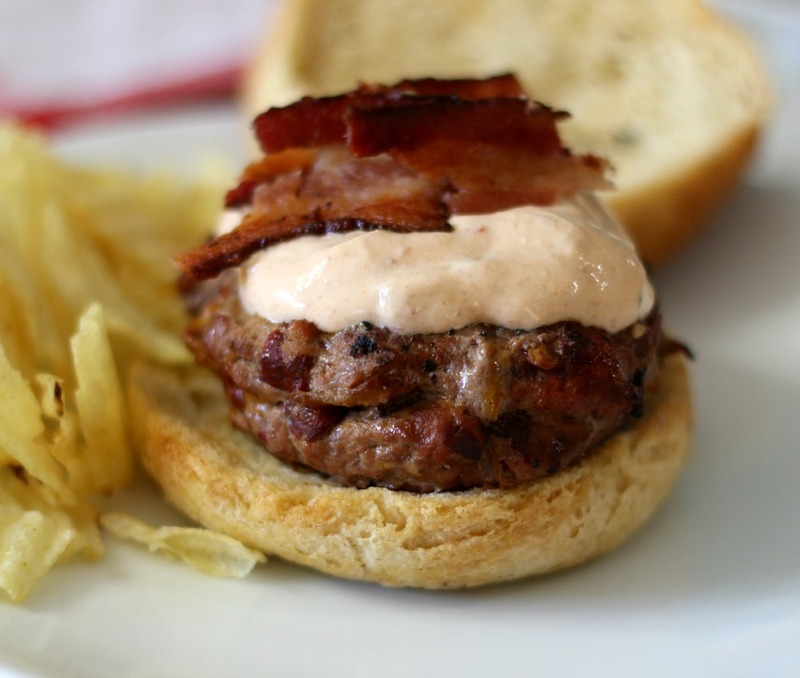 My Husband is all about burgers… I have to make this for him soon. I’m with your Husband! I am a big burger fan! Wow, these are some terrific burgers…the bacon, the chipotles, the cheese! So many amazing flavors that work perfectly together! Thank you so much Liz! This is one of our favorite kind of burgers! These look to-die-for! My family would love them. Pinning for later! 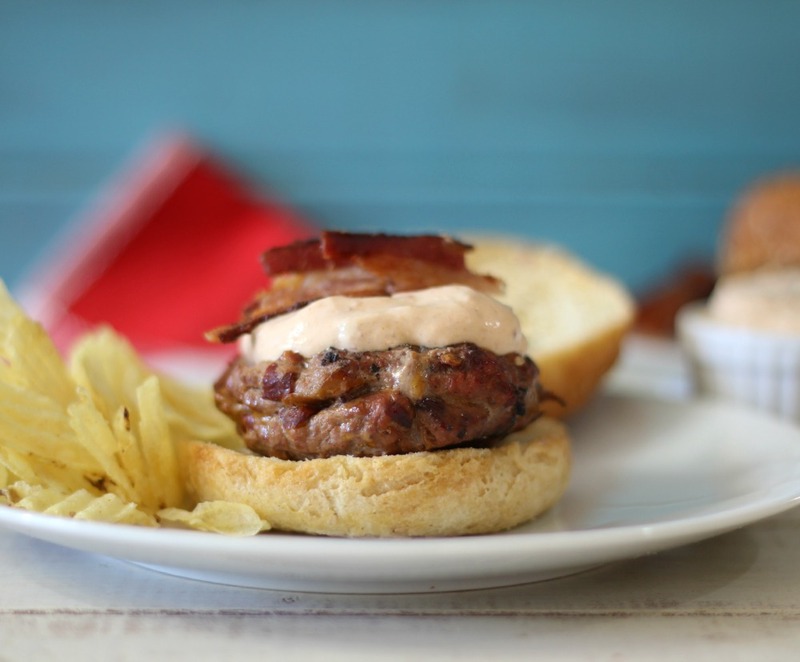 Bacon, cheese, and burgers….all the makings for some delicious man food! OMG, I just drooled all over my keyboard, now that is gorgeous and great man chow!!! I could go for this burger right about now. They look so moist and delicious Jennifer. Definitely man food. My man would love it. Happy Father’s Day! Absolutely mouthwatering!!! Wonderful work Jennifer!! Ha ha Thank you Sophia! This was a mouth watering burger for sure! This burger looks amazing. I love the aioli sauce too! My family will really enjoy this addition to our burger nights. Thanks for the recipe. Your welcome! Enjoy them! They are one of my new favorites! You had me at Chipotle and Bacon. Fantastic looking burger! Your aioli sounds awesome and the burger is definitely man food, but I’d love it too! pinned! Spicy, cheddar filled, bacon burgers? I’m in! These look awesome! I understand chipotle are smoked jalapenos? I’ll see if I can find them in the store. Hi Julie! Yes the chipotle peppers are smoked jalapenos and you can find them in the Mexican food section of the grocery store. They are in a can, called Chipotle in Adobo Sauce. 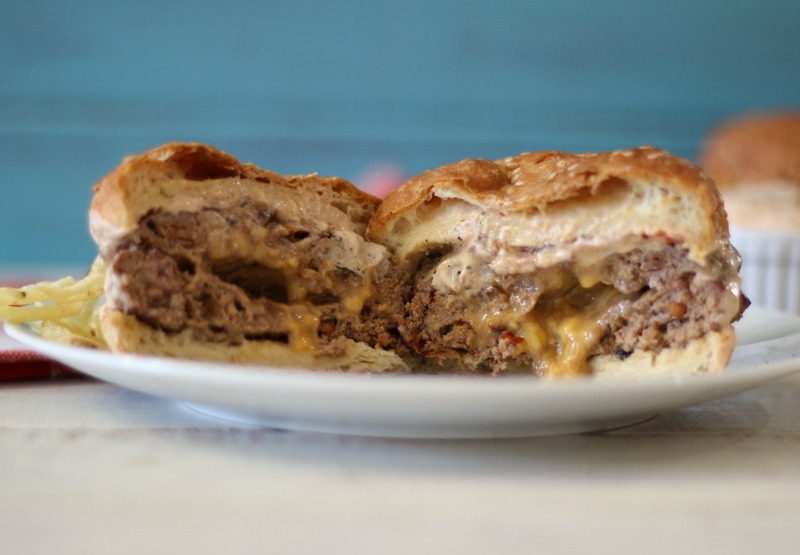 Stuffed burgers are a weakness for us, seeing that gooey cheese coming out of that burger makes me want one tonight. I think my sloppy joes I am making are going to seem inadequate. Ermagawsh I need this burger in my life stat! Fuggedabout the men, I want all the burgers and all the aioli sauce and all the bacon to myself! This is a get your hands dirty, sauce dripping down the face kind of meal. I love it! Ha ha! Thank you so much Nancy! Smoky spicy goodness! My son-in-law, aka grandkids daddy, would love these! Chipotle, Bacon and Cheese in a burger.. Count me in! Delish! Yummy, yummy, I need that burger in my tummy! lol Renee! You crack me up! This was so delicious! A lot of flavor, the right amount of spice, and the aioli was the perfect complement to the burger. My husband couldn’t get enough of this and neither could I, thanks for a great dinner! Thank you so much Amanda. I love these burgers, they are one of my favorites! I am so glad that both you and your Husband enjoyed them.